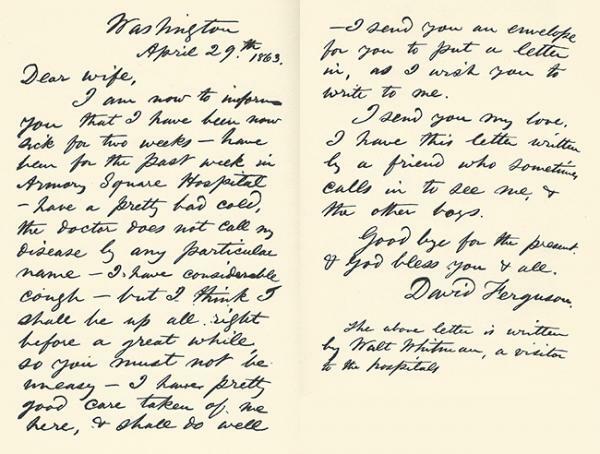 An 1863 letter that Whitman wrote for a Civil War soldier named David Ferguson to his wife; Whitman signed the soldier’s name and added a note indicating he had been the scribe. Courtesy Walt Whitman Archive. This week's text is “Come Up from the Fields Father." During the last decade of Whitman’s life, his famous poem about Abraham Lincoln’s assassination—“O Captain! My Captain!”—became his most reprinted and most anthologized piece, as the United States emerged from the era of Reconstruction and as Lincoln came to be revered and idolized as the “Great Emancipator.” But during the Reconstruction years, “Come Up from the Fields Father” was the Whitman poem that was most often included in the early literature anthologies and textbooks that were appearing with ever greater frequency in the United States in the decade after the Civil War. Telling the story of a mother receiving a letter informing her of her soldier-son’s battle injury, the poem neatly fit the conventions of a literature of sentimentality: it was made to elicit tears with its meditation on death, motherly love, and dashed hopes (one textbook writer said the poem’s power was in its “vivid and touching home scene”). Whitman even received letters from young women who recalled hearing their teachers recite it (“We, boys & girls were young, and merry, but we all felt the fresh country air, and later the deep pathos. . . . I do not think that any of us moved for a moment after the poem was ended, and then such a spontaneous, unpremeditated burst of applause, rose from girlish & boyish hearts, and surprised our teacher”) and who even recalled reciting the poem themselves and moving their audiences to tears. It captured the deep sense of personal loss that hundreds of thousands of families across the nation were feeling in those tense, sad years of Reconstruction, and the poem helped to remake Whitman’s image. He was still the radical experimentalist—this poem was, after all, unrhymed and without a recognizable metric pattern—but it nonetheless affirmed for many readers a reassuringly conservative set of values and evoked a socially sanctioned emotional response. Whitman sets the poem in Ohio, a state which escaped having any major battles fought within its borders, but one that sent well over 300,000 of its young men to the war. Many thousands never returned, and this poem captures the effect of one representative death on one representative Ohio family. The farm fields of many states had turned into battle fields and killing fields, where dead soldiers were buried and composted back into the soil, adding their blood and decomposing bodies to all the future nutriment of the country (as Whitman reminded us in “The Million Dead, Too, Summ’d Up”). In Ohio, however, the fields were not mixed with the dead, and the fall harvest was not haunted by the corpses of soldiers: instead, as the poem opens, all is “calm, all vital and beautiful, and the farm prospers well.” But no place in the nation would remain untouched by the war’s massive death, and now the son of this farm family, Pete, will never return to take over the maintenance of this fertile place from his father. As one of the daughters of the family calls the father up from the fields because a letter from Pete has arrived, the father simply vanishes from the poem as we enter into the domestic space of the farmhouse, where now the mother and daughters gather around to open Pete’s letter. What had been the safe and sonorous sounds of that Senecan word “Ohio” suddenly fracture into verbal shards of grief, as the “O’s” are amputated from the state’s name and become the isolated cries of the mother: “O this is not our son’s writing, yet his name is sign’d, / O a strange hand writes for our dear son, O stricken mother’s soul.” We have seen how Whitman’s writing of letters for injured and dying soldiers was one of his ongoing services in the Washington hospitals, and this poem could only have been written by someone who had thought deeply about the impact that his own letters, written on behalf of soldiers too sick or debilitated to write for themselves, would have when they reached the soldiers’ families, who would immediately see that the letter was written in a “strange hand.” We recall how Whitman would sometimes sign the soldier’s name to those letters, since many had lost their hands or arms or were simply too weak to write on their own. In this poem, Whitman probes deeply and imagines the horror of opening a letter that, because the writing is physically severed from the body that should have been doing the writing, betrays the fact that the soldier’s body is already lifeless by the time the letter arrives—as absent in fact as the absence of the familiar hand in the letter’s script. The very name of the soldier appears in a “strange hand,” and that severance of name and body signals a loss of identity. When the mother in the poem tries to read the letter, it too fragments: “All swims before her eyes, flashes with black, she catches the main words only, / Sentences broken.” She can only pick up disembodied pieces of the text, amputated phrases, and so the letter appears to her to be the reflection of what she now knows is her son’s broken body, damaged beyond repair. What she cannot see in the letter is the word “I,” because, though it must be there, it too is written in that “strange hand,” and the brokenness of the letter, the absence of Pete’s body’s attachment to the words that claim to be his, prevents the mother from perceiving a cohesive identity. Though the “letter” says that Pete will “soon be better,” the mother knows he is already gone. The broken form of the letter speaks louder and more truly than the words themselves. All the nutriment of that fertile Ohio farm in the lush “autumn,” the season of harvest, now can sustain no one. The father has vanished on his way up from the fields (just as Pete has vanished coming up from other fields), and the mother now leaves “her meals untouch’d,” rejecting the farm’s fertility and heading inexorably toward the same “withdrawal” that Pete has enacted—the dissipation of identity that the letter, like so many that it was Whitman’s sad duty to write, revealed simply by being in the hand of Whitman instead of that of the soldier. At present low, but will soon be better . See, dearest mother, the letter says Pete will soon be better . Poetic influence is notoriously difficult to trace. Spiritual affinities, temperament, taste, language, geography, ethnicity, sexual identity, politics—all combine in mysterious ways to form a poet’s inheritance, which he or she may not claim or even recognize. A notable exception is the Jesuit priest and poet Gerard Manley Hopkins. “I always knew in my heart Walt Whitman’s mind to be more like my own than any other man’s living,” he wrote to a friend in 1882. “As he is a very great scoundrel this is not a pleasant confession.” Although “Come Up from the Fields Father” was one of only three Whitman poems that Hopkins admitted reading, the alliteration and abrupt stresses in its title and opening line helped inspire him to develop his own distinctive “sprung rhythm,” a prosodic advance as important for poetry in English as Whitman’s free verse. Hopkins dismissed Whitman’s line as “irregular rhythmic prose,” but his expanded understanding of iambic rhythms was no less radical; from both sides of the Atlantic these men opened new acoustic spaces in which to hear poetry, reinvigorating an art form that had gone stale. Sometimes a poet may be influenced by another poet’s inferior work, delighting in a single phrase or cadence or combination of sounds: the alliteration of “fields, father,” for example, may have been rattling around in Hopkins’ auditory imagination when he composed “The Windhover,” which begins, “I caught this morning morning’s minion, king-/dom of daylight’s dauphin, dapple-dawn-drawn Falcon,” and ends with “Fall, gall themselves, and gash gold-vermillion.” The subject matter of these two poems, and indeed the quality, could not be more dissimilar: Hopkins’ ecstatic praise song to Christ our Lord is a masterful essay on the ways in which his “heart in hiding/ Stirred for a bird—the achieve of, the mastery of a thing,” while Whitman’s fictional (and rather more conventional) rendering of a family’s reaction to the delivery of their son’s last letter home elicits more somber emotions. The distraught mother, who like the Virgin Mary has lost her only son, will find no religious solace, no outlet for her grief, no reason not to follow the dead into the earth. The letter in a stranger’s hand, thousands of which Whitman himself wrote, arrives during the fall harvest, the fertility of these fields a stark reminder that other fields are filled with the remains of Union and Confederate soldiers: the grimmest harvest imaginable. Whitman’s depiction of the mother’s shock—“Sickly white in the face and dull in the head, very faint, / By the jamb of a door leans”—echoes two crucial lines in “Song of Myself”: “Unscrew the doors themselves from their jambs!” and “I lean and loafe at my ease… observing a spear of summer grass.” In his conflation of ideas central to his pre-war poetics he steers close to Hopkins, who one morning would “wake and feel the fell of dark, not day.” The very premise of Whitman’s celebration of the self and the universe was upended by the war that left countless grieving men and women desperate to “withdraw unnoticed—silent from life.” Sing that. “Come Up from the Fields Father” is a poem that is based on the close correlation that people often felt between a person’s “hand” (the particular script that identified the writer, so that simply by glancing at the idiosyncrasies of any individual person’s handwriting you could identify whose writing it was) and the identity of the person doing the writing. We may have lost some of that quick and firm association between a person’s handwriting and a person’s identity in the digital age when most of our communications are carried on by typed electronic messages. Still, we somehow treasure documents that are written by hand, and an author’s manuscripts have an aura and mystery that is palpable. There used to be thousands of “handwriting experts” who claimed to be able to read a person’s character by looking at their script. Think of a particular person’s handwriting that you can immediately identify when you see it, and investigate what allows you to make that identification. How would you describe your relationship to that person’s handwriting, to that person’s “hand”?